Hi Everyone….. There is a lot going on with Fuji this year..new products, new experiences . Fuji just keeps plugging along bring us one after another of new image making equipment. All Bill and Jack can say today is just wait—-you all are going to be very happy folks in the coming year and beyond. This is obviously all good news, but YOU are still the one who has to make the photograph! Having said that… we are here to help. 2017 will be our 3rd year providing workshops for ONLY users of the Fuji “X” system. We’ve covered many locations already and are adding new exciting ones for 2017. It sure is fun when everyone on a workshop uses the same system. It sure makes our life easy and lets us dedicate more time to showing you how to get the most out of your equipment. We also stress the more cognitive aspects of photography such as seeing , developing a concept and visualizing images. The technical aspects are important but without understanding how important the “thinking” end of photography is , all of the best equipment in the world will not help you grow as photographers. On all events there are representatives from Fuji along with us that bring lots of equipment for you to try out as well as answer questions and add to your experience . Below is our schedule for 2017. There events fill fast so please don’t delay in registering. All workshops are $995.00 per attendee*** If you register prior to Jan 1, 2017 you’ll receive a 10% discount. If you are a returning attendee you will receive a 10% discount. If you are both that’s 20%! Registration forms including deposit information are at the top of this post –or just click Fuji-X-Registration-Form. Please consider joining us ! THE “PALOUSE REGION of EASTERN WASHINGTON” June 8-11, 2017 Colfax, WA. FALL in GRAND TETON NATIONAL PARK Sept 29-Oct 1 2017 Jackson, WY. AUTUMN IN THE GREAT SMOKY MOUNTAIN NATIONAL PARK Nov 9-12 2017 Townsend, TN. 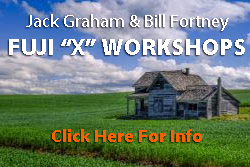 *** workshop price does not include travel, lodging or food expenses. Previous PostThe FUJI “XF 2X TC’ TELECONVERTERNext PostThe FUJI “X”SYSTEM 2016..watch the video !